Bring together organizing and learning in a fun way! Have you ever seen a children's storage unit that encourages storage and reading at the same time? No more needing to say "Clean your room" over and over with this bookcase. Children enjoy tidying up their rooms because it is much easier to put their books, school supplies and other items in this stand. Made from MDF boards and polyester fabric, easy to clean, and very sturdy. Large base ensures its stability. Smooth-rounded edges prevent children from bumps and snagging their clothes. The anti-tipping device is provided to fix the shelf to the wall for added safety. 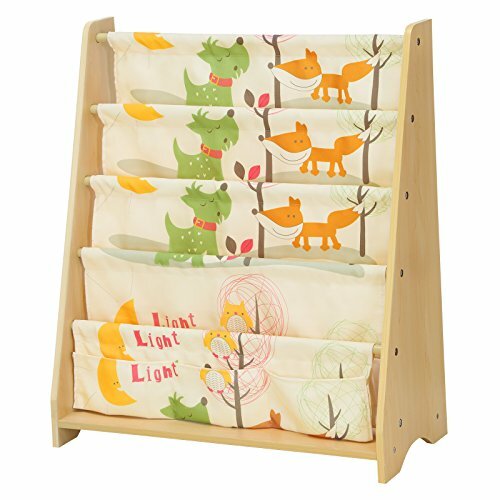 This beautiful bookcase perfectly complements your child's room, and also promotes organization and reading skills. Don't wait any longer and give this storage cabinet to your children! Develop their aptitude with hands-on skill practice and stimulate their interest in learning!